From Goodreads ~ When tragedy strikes a West Virginia coal mining family, two children start out on a trek that they hope will lead them to a new life. Before a day passes, the children are separated and the boy is caught up in a robbery not of his making. If his sister can find him, she may be able to save him. The problem is she’s only seven years old and who’s going to believe a kid? Paul is 16 and Jubilee is 7. Their mother died a few years ago and their father had just died in a mining accident. They have nowhere to live now so they set out to find their mother's sister, Anita. Their mother and Anita had a falling out many years ago and all Paul knows is that she used to live in Wyattsville. So packing a few mementos and what little money they have, they set off to find Aunt Anita. On their first day in Wyattsville, Paul is in the wrong place at the wrong time and he and Jubilee become separated. 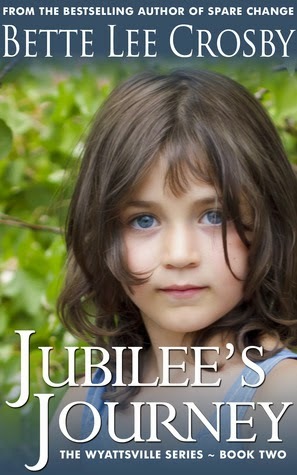 Luckily she is taken in by a kind woman and her grandson but Jubilee is determined to find Paul and get back together with him. This is the third book I've read by this author and I enjoyed the story. It is the second of three in the Wyattsville series (I've read all three) ... they also work as stand alones. It is written in third person perspective, though some chapters are in first person perspective ... they are short and italicized and the name of the person is at the beginning of these chapters so you know who the focus is. This style worked for me as it let me get into their heads and know what they were thinking. Some of the main characters in this book were in Spare Change, the first in the Wyattsville series, like Olivia and Ethan Allen. I found the writing a bit awkward and frustrating at times because the author was trying to tie some of the events from Spare Change into this one without I'm assuming giving too much away. It's been almost two years since I'd read the first one and I couldn't remember the details. I think she did this to explain the tension between two cops who had issues with each other. It would be enough just to say that they didn't like each other because of a previous case and left it at that. Paul and Jubilee pop up again in Passing Through Perfect, the third in the series so I knew what had happened with them. I received a copy of this ebook from the author at no charge in exchange for my honest review.